He was hanging out on my mailbox. I wish he would have paid my bills. 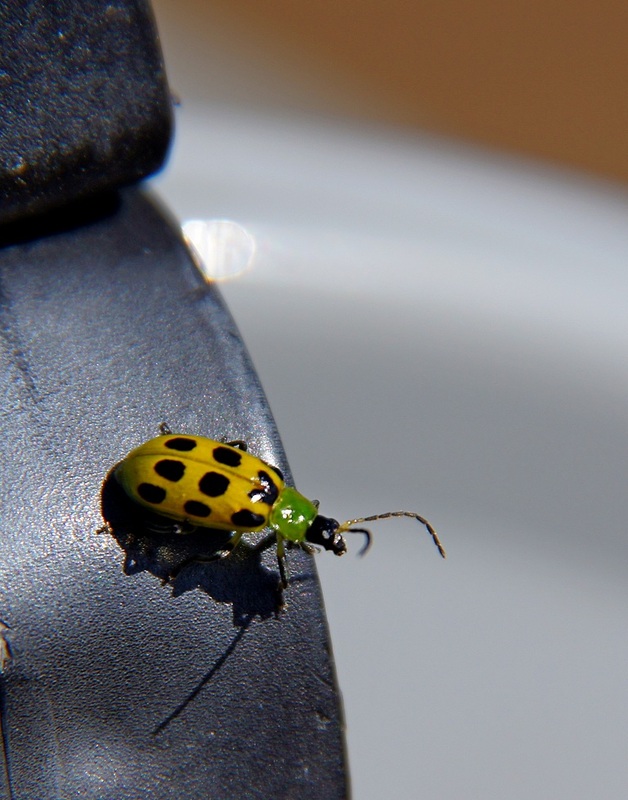 Colorful critter, your cucumber beetle. Great shot! My mailbox has spiders that love to live there..I don't like them but, yes..they are there and I am always careful when I open my mailbox..and I too, would carry my camera to snap a photo..that's what we do! great shot! Cute -- a yellow lady bug. I take my camera everywhere! Thanks for hosting. A very pretty and colorful insect. Great capture, Misty! Wow....what colors!! Pretty. But, do you take your camera to the mail box, with you? He's so cute! I agree....I carry my camera EVERYWHERE! Very colorful bug! I like all kind of small critters and chase them all over with my camera. You never know when a photo opportunity will come your way! Nice shot of this colorful little beetle. Nice capture Misty. Love the color and crisp detail. What lovely colours and crisp detail. And it's a good thing you did. This is a great shot, Misty!